Proposes bold, yet principled approaches-including financial policy alternatives and specific courses of action-to deal with this unprecedented, systemic financial crisis* Created by the contributions of various academics from New York University's Stern School of Business* Provides important perspectives on both the causes of the global financial crisis as well as proposed solutions to ensure it doesn't happen again* Contains detailed evaluations and analyses covering many spectrums of the marketplace Edited by Matthew Richardson and Viral Acharya, this reliable resource brings together the best thinking of finance and economics from the faculty of one of the top universities in world. The financial crisis that unfolded in September 2008 transformed the United States and world economies. As each day's headlines brought stories of bank failures and rescues, government policies drawn and redrawn against the backdrop of an historic presidential election, and solutions that seemed to be discarded almost as soon as they were proposed, a group of thirty-three academics at New York University Stern School of Business began tackling the hard questions behind the headlines. Representing fields of finance, economics, and accounting, these professors--led by Dean Thomas Cooley and Vice Dean Ingo Walter--shaped eighteen independent policy papers that proposed market-focused solutions to the problems within a common framework. In December, with great urgency, they sent hand-bound copies to Washington. 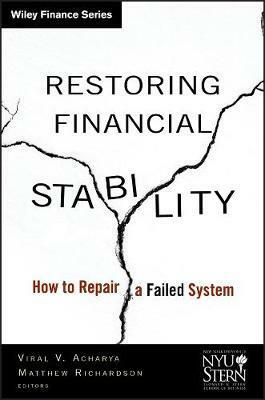 This book, Restoring Financial Stability: How to Repair a Failed System, is the culmination of their work. For policymakers and business executives alike, the book proposes bold ideas--financial policy alternatives and specific courses of action--to deal with this unprecedented, systemic financial crisis. Their remedies acknowledge the power and potential of the free market. Some require modest regulatory intervention; others will shake regulatory practice to its very foundation. To better understand the origins of the current financial crisis as well as the options for restoring financial health, don't miss this important and timely work. Edited by Viral Acharya and Matthew Richardson, this reliable resource brings together the best thinking of finance and economics faculty from one of the top universities in world. "Although we are yet in the midst of a gigantic global financial crisis, the academics who contributed to this timely and comprehensive compendium have provided us with not only an excellent analysis on each topic, but also timely recommendations as to how to move forward responsibly to develop the next generation of our financial-service industry architecture." "The authors provide important perspectives on both the causes of the global financial crisis as well as proposed solutions to ensure it doesn't happen again. A must-read for anyone interested or involved in the financial markets." --John Paulson, President and founder of Paulson & Co, Inc.
--Henry Kaufman, President of Henry Kaufman & Co., Inc.